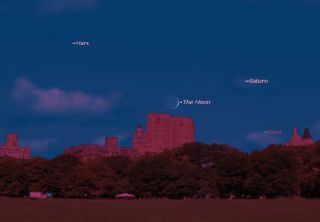 This sky map shows the location of Saturn, as well as the moon, Mars and bright star Spica,as they will appear at about 7:15 p.m. to observers on Sept. 17 in mid-northern latitudes. Attention, stargazers! Tuesday night (Sept. 18) is your last chance final opportunity this year to glimpse the ringed wonder of our solar system, the planet Saturn, in the night sky. Since early spring, Saturn has been a fixture in our night sky. Shining with a steady and sedate yellow-white glow, not far from the bright bluish star Spica in the constellation Virgo, Saturn has been a fairly prominent sight right on through the spring and much of the summer, even briefly teaming up last month with Mars to produce a striking triangle configuration in the western sky after sundown. But now, Saturn has reached a point where its low altitude and its proximity to the bright twilight glow is making it increasingly difficult to see. Nonetheless, on Tuesday evening, there will be one final opportunity to readily identify the planet before it disappears into the sunset fires. Scanning the sky with binoculars will certainly help make out this sight. What you see won't be a star, however, but Saturn. It will glow roughly 8 degrees to the moon's upper right. For reference, use your clenched fist, held at arm's length, which measures roughly 10 degrees. Saturn will appear a little less than one-fist's length to the moon's upper right. Saturn is now 987 million miles (1.59 billion kilometers) from Earth. Because of its low altitude, now is not a good time for a telescopic view of this giant world, but by using a magnification of at least 30 power, you can still make out Saturn's famous rings, tilted 15 degrees from edgewise. Just three years ago, the rings were turned edge-on toward us and were virtually impossible to see. Five years from now, they will be tilted at their maximum inclination (27 degrees) toward us. You might still be able to find Saturn after Tuesday for a few more evenings, although without the moon as a benchmark, beginners might have a more difficult time sighting it. After becoming hopelessly immersed in bright twilight, Saturn will pass through conjunction with the sun on Oct. 25. When it again comes back into view it will be in the morning sky in mid-November, rising just before the sun. During the latter part of that month, you'll be able to find Saturn due to its proximity to another brilliant object, the planet Venus. In fact, the two will have a very close encounter on Nov. 27 in the dawn sky. Editor's note: If you snap an amazing photo of Saturn or any other night sky view, and you'd like to share for a possible story or image gallery, send images and comments (including name and location) to managing editor Tariq Malik at tmalik@space.com.